Have you ever seen an actual cochlear implant? You might have seen pictures of an implant, or an X-ray of yours. But have you ever actually seen what it looks like before being implanted? 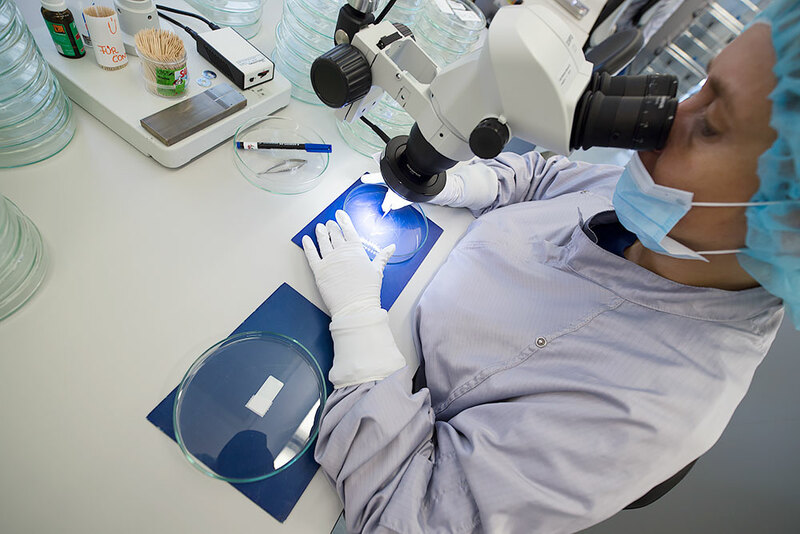 Now you can: we’ve put together a behind-the-scenes look at how a MED-EL cochlear implant is made. And, over the next three weeks, we’ll be sharing never-before-seen pictures that bring you face to face with the people and technology at MED-EL. If you’re new to cochlear implants, it might help to start with our animation about how cochlear implants work. In this first post, we’ll start with how we make the amazing part of a cochlear implant, the part which sends the sound signals to your cochlea: the electrode array. MED-EL cochlear implants are the ultimate combination of the handmade and the high-tech. MED-EL electrode arrays all start with our unique wave-shaped wires. Each wire is only about 0.025 millimeters wide, just 25% as wide as a human hair. And, they’re made out of 90% platinum and 10% iridium for the ultimate in corrosion resistance and strength. It’s these wires that carry the sound signals to your ear. 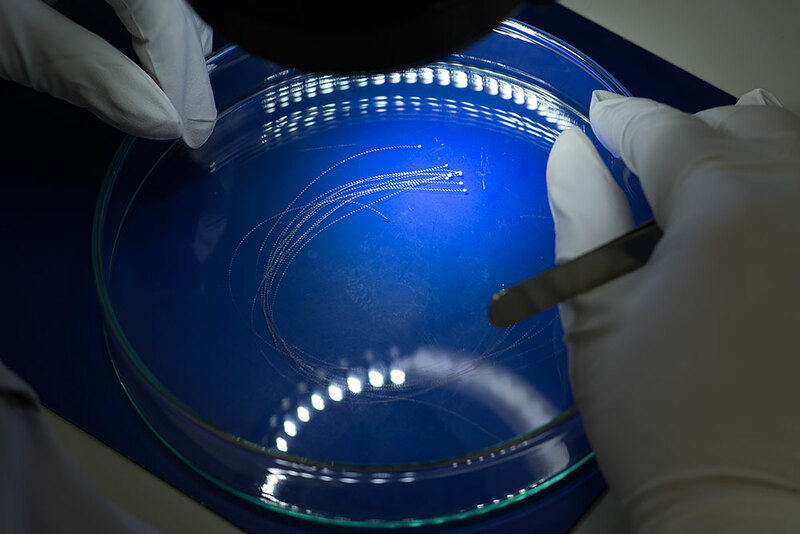 We’ve been making wave-shaped wires since the very first MED-EL cochlear implant. Their special shape enables an electrode array to be extraordinarily soft and flexible. This helps it to protect the delicate nerve cells in the cochlea that you need to be able to hear. 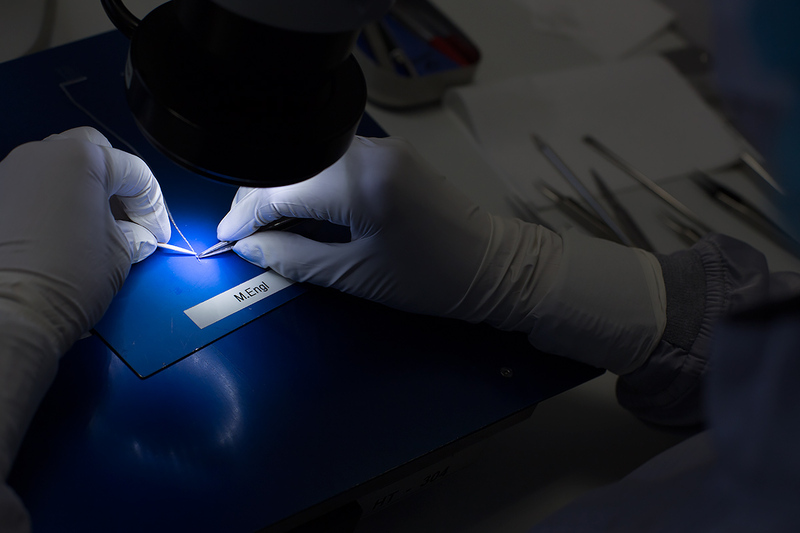 It takes about a half year of training to fully master the manufacture of an electrode array. Once the engineer has passed all their tests, they’ll become one of more than 200 other highly-skilled specialists who make MED-EL cochlear implants. 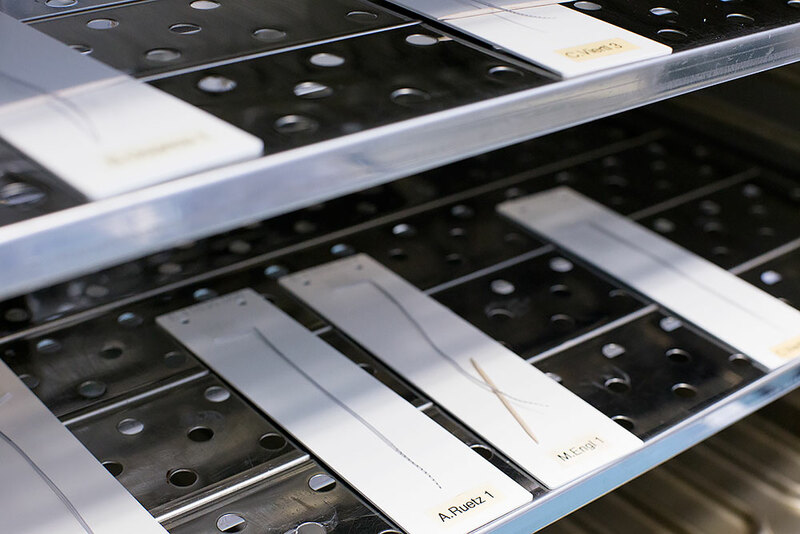 All MED-EL electrode arrays are made in a hygienically controlled clean room that’s even cleaner than a modern hospital’s operating room. To make sure that the room stays as clean as possible, the entire outfit each specialist wears is used only once before being washed or recycled. Electrode arrays get their shape thanks to our custom-made metal forms like this one. Each wave-shaped wire is individually placed in this form and lined up so that it stimulates a certain range of sounds. There are up to 24 of these wires in a single MED-EL electrode array. Once all the wires are correctly positioned, the form is sealed up and a special mix of silicone is injected inside. At this point the silicone is still a liquid, so we have to put it in a specially designed heat chamber to make it solid. In the picture above, you can see what an electrode array looks like after it comes out of the heat chamber. 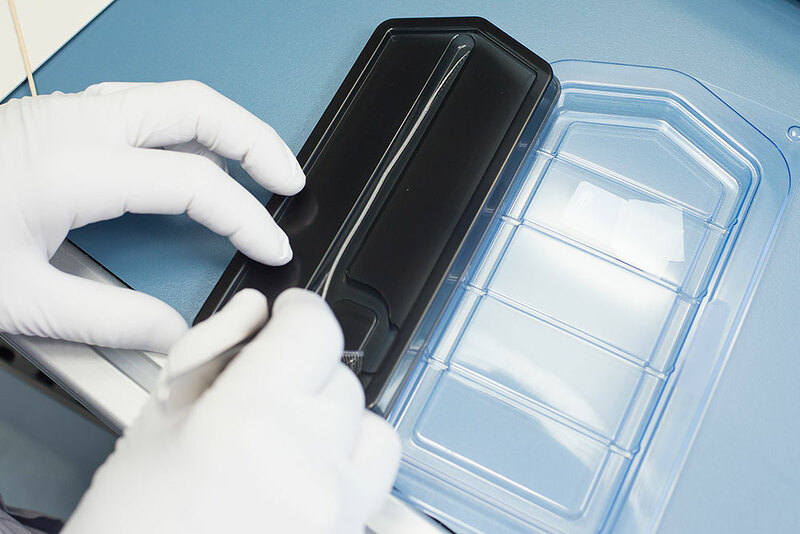 Each electrode array is kept in the heat chamber to make sure that the silicone is completely cured while still being flexible. Once they’re ready, then each form will be taken out and opened up. 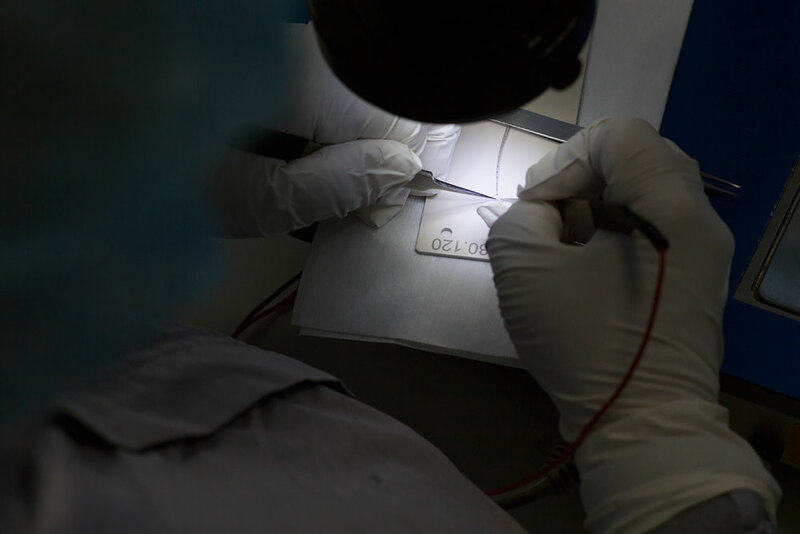 The newly-born electrode array is then put on one of these white plates marked with the name of the engineer who manufactured it. We have the widest range of electrode arrays available: 9 in total, plus custom designs. Each of these arrays has a different length, shape, or design because we know that one size doesn’t fit all. Each cochlea deserves an electrode array which fits its specific shape and size. Now, they might look beautiful from the outside, but that’s not enough. After this, each electrode array is put through a number of reliability tests to make sure that it works perfectly. For example, here a specialist uses an Ohmmeter to check that each of the wires can properly send its sound signal to the cochlea. After these tests, the electrode array is ready for the next step: becoming part of a cochlear implant. 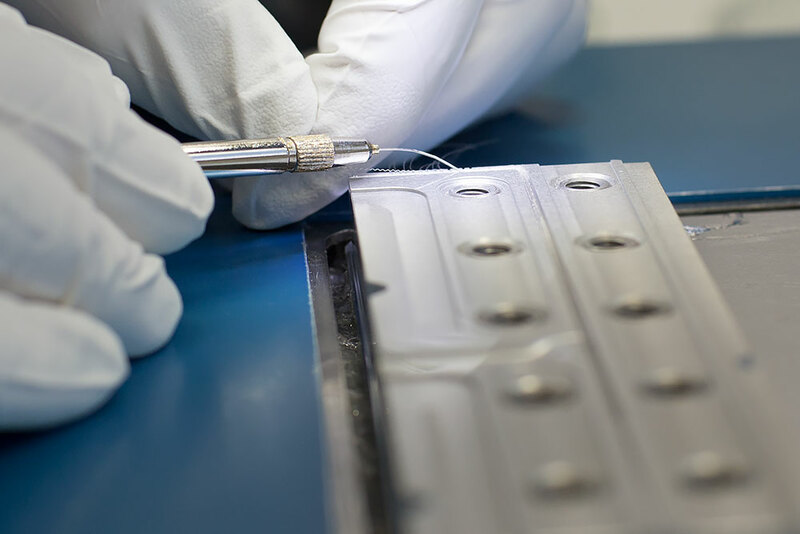 Each electrode array gets put in a special protective case and is carried, by hand, from our electrode manufacture to the implant assembly facility. Check out part two: how a MED-EL cochlear implant is manufactured!